Replacement Trampoline Pads & Trampoline Spring Covers. Free Delivery! Our Trampoline pads are of the highest quality and far superior to PVC padding that you can find at other trampoline pad manufacturers, which often crack in the sun, and can fit any size trampoline. Trampoline padding has a big impact on the safety, comfort and durability of your trampoline and so if you need to replace your trampoline pad, for any trampoline manufacturer, we stock all sizes of round trampoline pads from 15ft trampoline pads right down to 6ft trampoline pads. We know that all products eventually succumb to wear and tear, the trampoline pad is no exception, even though the trampoline pad is made from high quality materials, its natural life can come to a premature end by accident. Our Trampoline Pads: 12mm thick 260mm wide double thick weather resistant padding. The padding is a waterproof top layer vinyl, bottom layer PE and has closed-cell foam that does not absorb water or mildew or lose shape. The trampoline pad is fixed securely with toggle system, and elastic ties with hooks. All our Trampoline pads are double thick weather resistant trampoline padding. The trampoline pad is a waterproof Top layer vinyl/polyester, bottom layer PE and has closed cell foam that does not absorb water, mildew or lose shape. If you have any question regarding pads for trampoline or need any help looking for trampoline padding please call us free on 0800 032 5879. 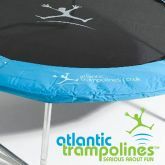 Atlantic Trampoline is a specialist trampoline, trampoline accessories and trampoline parts supplier. We offer free, next day delivery on all trampoline pads and all our trampoline products.